Pro Se Productions, a leader in Genre Fiction, announces the latest story in Russ Anderson’s monthly Pro Se Single Shot Signature Series, Flygirl, as well as the teen heroine’s first short story adventure in the series now being available for free! In the latest tale, Flygirl: The Blue Bullet Flies Again, there’s a new hero soaring the skies above Phoenix, Arizona. Bursting out of a forgotten TV show from the '80s, the Blue Bullet is back on the scene and ready to help fight crime in the Valley of the Sun. When Fly Girl meets him, an old-fashioned team up is in the offing... but when tragedy strikes, she may find out that not everyone is cut out for this superhero gig. 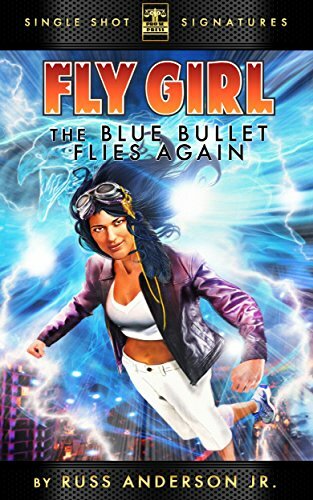 Flygirl: The Blue Bullet Flies Again features a great cover and logo design by Jeff Hayes and digital formatting by Anderson. The fourth story in this digital single series is now available at www.amazon.com for the Kindle and for most other formats at www.smashwords.com for only 99 cents. Also, starting today, Anderson’s first Flygirl story, The Origin of Flight is now available for free permanently. New readers can take to the air for the first time with this innovative and exciting heroine for absolutely no cost. Flygirl: The Origin of Flight also features cover and logo design by Hayes and digital formatting by Anderson. The introductory story in this series is available for Free on www.amazon.com and for most digital formats at www.smashwords.com.